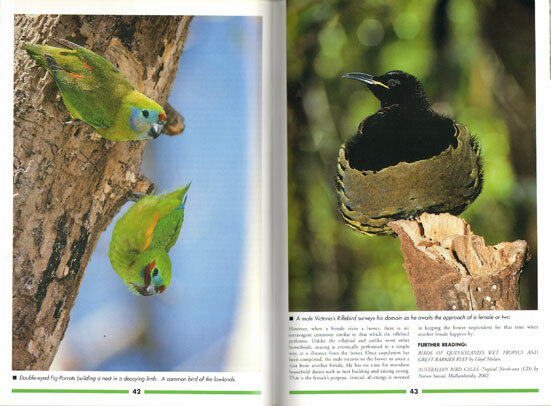 Daintree: jewel of tropical north Queensland. 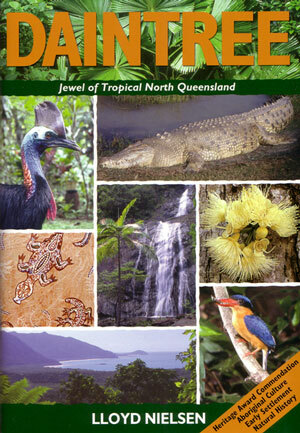 This popular booklet combines the natural and local history of the Daintree. It tells the story of one of Earth’s oldest rainforests, one which has virtually survived intact for about 120 million years. The Daintree rose to prominence in the 1980s following the discovery of one of the greatest concentrations of primitive flowering plants on Earth – plants which occur nowhere else. Readers are taken on a journey which begins with its geological birth and ends with the Daintree as we see it today. Topics range from flora and fauna (includes the cassowary and crocodile), to the fascinating culture of the first human occupants (the Kuku Yalanji aborigines), the battle to save the Daintree from certain oblivion after developers began subdividing the rainforest, and the rapid changes brought about by European settlement. Author, Octavo, paperback, colour photographs, map. 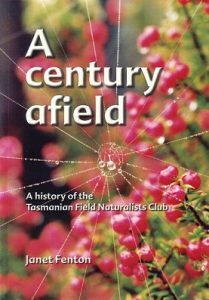 An account of the history of the club to mark its centenary. Let the land speak: a history of Australia: how the land created our nation. To understand Australia’s history, you need to look at how the land has shaped not just our past, but will continue to shape our future. From highly respected, award-winning author Jackie French comes a new and fascinating interpretation of Australian history, focusing on how the land itself, rather than social forces, shaped the major events that led to modern Australia. Our history is mostly written by those who live, work and research in cities, but it’s the land itself which has shaped our history far more powerfully and significantly than we realise. 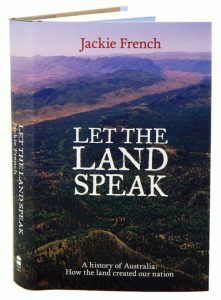 Reinterpreting the history we think we all know – from the indigenous women who shaped the land, from Terra Incognita to Eureka, from Federation to Gallipoli and beyond, Jackie French shows us that to understand our history, we need to understand our land. Taking us behind history and the accepted version of events, she also shows us that there’s so much we don’t understand about our history because we simply don’t understand the way life was lived at the time. 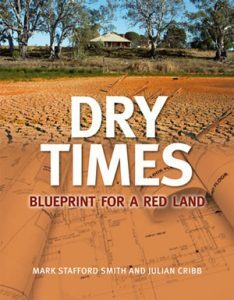 Dry times: blueprint for a red land. Artist/Author: Stafford-Smith, Mark and Julian Cribb. With the knowledge from our deserts, Australians can reshape the human story. The desert is teaching us new ways to live, manage slender resources, and cope with lack of water and energy, harsh climate and isolation. These issues will confront most of the world’s citizens in the 21st Century, as climate change, population growth and resource scarcity impact on society. The deserts also teach us what it is to be Australian, how to dwell within the rhythms and constraints of a vast continent that is three quarters arid. Australians find it hard to decide about the Outback: is it remote and unassailable  or at the core of our national identity? Endlessly we debate whether we should develop the inland  or ignore it, because it’s too hard and too costly. Learning how to live well in desert Australia lies at the heart of our destiny as a nation, and at the centre of our response to climate change. It engages the culture, knowledge and skills that will matter most to future Australians as they strive to sustain themselves in world on the edge of sustainability. It is the ultimate test of our resolve to discover a truly Australian way to live on this continent. As the world faces increasing drought in the uncertain climate of the future, it is also a source of knowledge to export to many other places. This book is a wake-up call to Australia and the world. It explores wellsprings of creativity and innovation from the desert that can deliver solutions to the challenges of living in an uncertain and threatening future. It describes many positive lessons for our nation and humanity in a changing and resource-scarce world. Collecting curiosities was a gentlemanly occupation for wealthy and educated 18th-century Europeans. Few creatures aroused more curiosity than those from Australia. But collections demand organisation, and classification itself reveals patterns to life that cannot be ignored. From a leisurely occupation, the science of biology was born. Cabinets de curiosites became national museums, with specimens from Australia playing an integral role in all kinds of biological debates. Australian museums now foster their own research and continue to provide major and sometimes unexpected perspectives to international scientific developments. 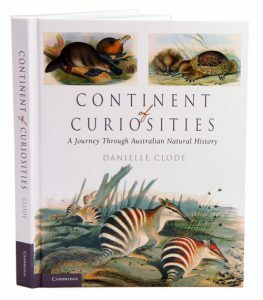 Continent of curiosities follows the thread of individual natural history stories through the scientists of one of Australia’s oldest museums, Museum Victoria. Together, these stories weave a history of the development of biological science from an Australian perspective, with insights into the people and places that influence the way we see and understand the natural world around us.